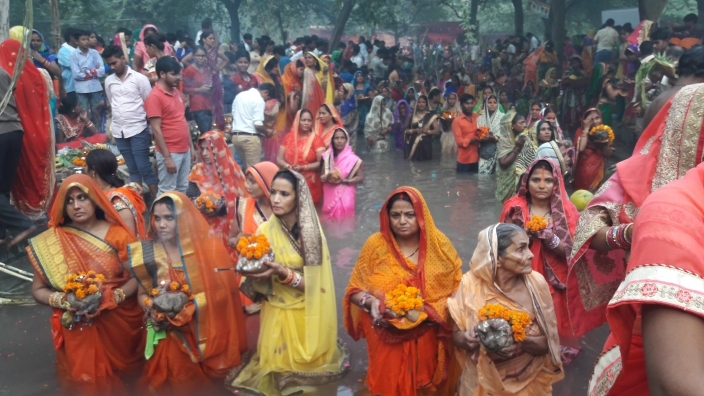 Each year, Hindus mostly in the northern states of India worship the Sun God Surya with the "Chhath Puja". I was fortunate to closely observe and attend these celebrations in Delhi in November last year. As an intern with India Today TV, I went to one of the many places in the city to witness this Puja with the editor and the camera team to that Chhath Puja in Deer Park. It was an amazing experience. 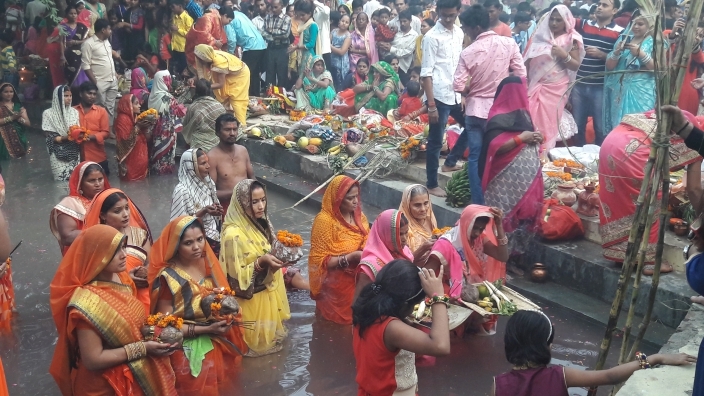 Due to pollution and lack of water in natural resources like a river, the community there had built an artificial river for the devotees to celebrate at the banks and in that river. The women in the pictures were standing in the water for hours, holding offerings towards the sun until sunset. Hundred others participated by standing on the banks of this ‚river'. It was an extraordinary atmosphere. The reporter from India Today TV was reporting from the middle of all of this - live broadcasting from the spot. Another interesting highlight for me was also when I met some RSS members at this celebration (we had heard some critical opinions about the RSS earlier). As leaders in their communities, the RSS Members had organized the celebration, had invited musicians and theatre groups who played in a tent close to the river. They invited me to join the celebration and placed me on a seat in the middle of the RSS committee. The celebrations became even more enthusiastic at sunset. Unfortunately, we had to leave the spot (just when the party began !!!) to return to the India Today Building in Noida and finish the report for Ajtak, the India Today Hindi Channel.